This year, the general theme of my Christmas decorating is somewhat rustic. It is also focused on winter themes and the great outdoors, which is so appropriate living in Colorado. This Rustic Winter Christmas Centerpiece brings it all together…a touch of Colorado and Texas! Having just returned from the Thanksgiving holidays in Dallas, decorating for Christmas is in full swing here!! The popular singer and actress, Dale Evans, from back in the day wisely said: “Christmas, my child, is love in action.” Decorating my home for the holidays is definitely “love in action” for my family. It has always been important to me to create a beautiful, cozy, yet festive home environment for my family. Also, it is a labor of love for those friends and family that join us from afar! A few weeks ago, I posted this Rustic Winter Christmas Table Setting designed for our breakfast room. Here is one shot of it. Click here to see the whole post! My island is right next to this table, so taking the design features of this table setting into consideration was important. In keeping with this rustic Christmas table setting, I coordinated this season’s centerpiece for the island with a similar look. Having a passion for all things “Santa”, it was a great place to start and this one totally fits the bill! You could certainly use any Santa you have or other holiday figures…a snowman, small Christmas tree or whatever you might have on hand. TJ Maxx has a great selection, as does Hobby Lobby. Because our 16-foot island is so large, using this large wood serving platter was a perfect base for the design. It also certainly added to the rustic feel. 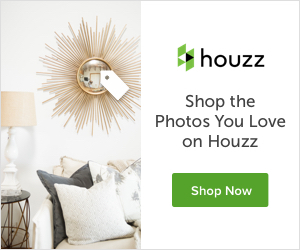 I used the same platter (from West Elm) in my recent Fall Kitchen Tour. Click here to see! Re-using pieces you already have is an essential part of keeping these projects affordable! If you don’t have a large wooden platter, you could also use a large wood cutting board or any other large tray. Once the platter and the rustic, casual Santa were set, I added in the greenery. In this case, faux greenery worked best so it would stay pretty through Christmas. Real greenery would not last long enough. Certainly, I would prefer to use real foliage (as in most other applications in my home), but it would have to be replaced too often. Don’t we all have enough to be doing this holiday season?!?! Next, I followed up with adding in the birch candles (use a variety of sizes and heights). I love the rustic, winter texture that they offer. DESIGNER TIP…to add height to the bigger candle, place a glass bowl or something similar under it! Finally, the adorable little deer were placed in the open spaces and then the ornaments and votive holders were dropped in. Having mentioned it before, every holiday centerpiece should have a bit of sparkle. Here, the mercury glass ornaments and votive holders did the trick! I purchased the little deer (they were actually ornaments) at Pier One last season and just cut off the burlap loop. To coordinate with the Rustic Winter Christmas Centerpiece, I added some other Christmas decor to the tray with the apothecary jars on the back counter. The apothecary jars filled with flour, organic sugar, and kosher salt are a staple in my kitchen. For the greenery, it happily came straight from my garden. Having fresh rosemary and sage in the kitchen is so decadent and still feels “holiday” festive. 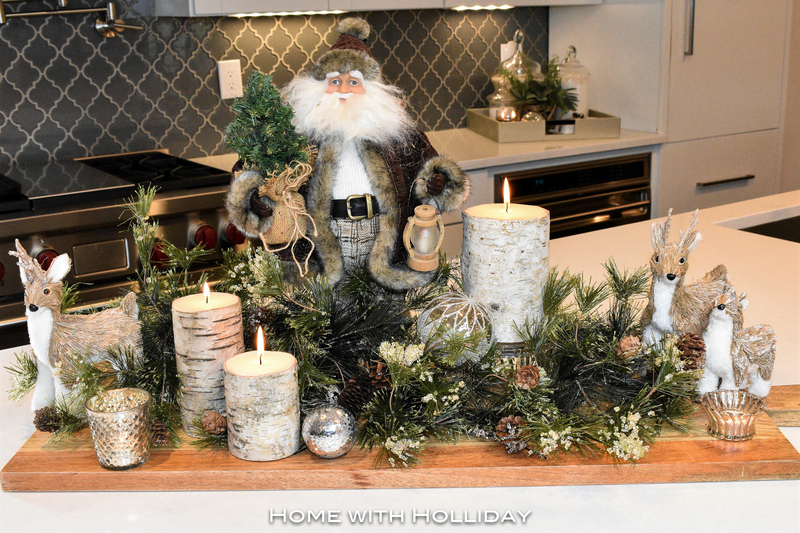 Thank you for stopping by today to see how I created this little Rustic Winter Christmas Centerpiece. A similar set-up could certainly work as a centerpiece for a table setting and could be sized up or down if you have smaller spaces. Be creative!! Please consider subscribing to my blog to receive instant email notifications for new posts. You can also follow my Pinterest Page with Christmas Decor Ideas which features over 1000 inspirations for Christmas Decor.